You read that correctly: you can add American 1 Oz Gold Eagles to your holdings at just 2.49% over spot. That’s for any quantity – and includes free shipping. 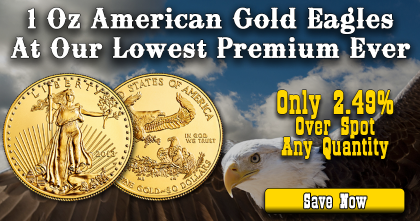 How can we offer you the world’s most popular gold bullion coin at such a low premium? Simply put, it’s a very unusual bullion market right now. There are many factors currently supporting the price of gold. The U.S. Dollar is softening, concerns are growing about a stock market bubble, North Korea tensions persist, political turmoil remains in Washington, wages continue to be sluggish, and the economy appears completely dependent on low interest rates. Normally these would trigger a dramatic gold rally, but that hasn’t happened. Why? Today, major institutions are funneling money towards stocks, bonds and real estate. Precious metals are being overlooked. In addition, some large quantities of physical precious metals have been liquidated in the marketplace. The net result is that premiums remain exceptionally low – if not the smallest we’ve seen in over a decade. How low exactly? When the U.S. Mint sells new 1 oz gold Eagles to its authorized distributors, it charges 3.00% over spot. In “normal” markets, the wholesale price of a gold Eagle almost never dips below 3%. However, thanks to some massive liquidations, the wholesale price of a 1 oz gold Eagle has dropped below this threshold. Many investors wait for a pullback in spot price before buying gold – but grabbing product at a low premium accomplishes the same goal. Normally these gold Eagles are priced at 4-5% over spot. Stocking up at today’s 2.49% premium is like having spot drop by $20-$30!